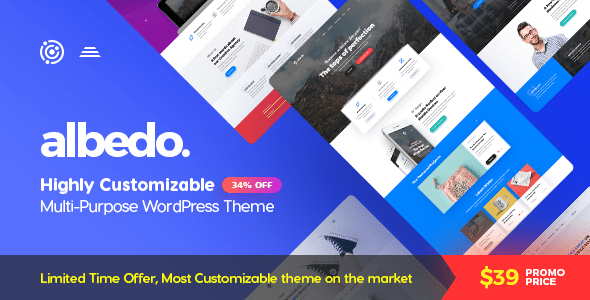 Albedo : version 1.0.33 – A WordPress Highly Customizable Multi-Purpose Theme is powered by visual composer, the powerful visual builder witch stands at the core of WordPress Albedo theme. The simplicity with who you will build or edit page will blow you way. Finish your project much more faster with Albedo theme download. Albedo is a Highly Customizable Multi-Purpose theme that gives users flexibility to build website layout and design for their business. The Albedo theme comes with powerful page builder and a lot more options. Albedo theme supports advanced and modern technologies: it is developed for WordPress live customizer and visual composer front end builder. What you see is what you get: this is the fun-damental principle for us. Check yourself how it’s easy to customize this theme with your needs.